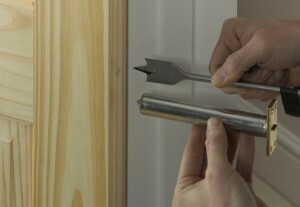 A door closer is fitted to a fire door. Fitting a door closer to an existing door will not make a fire door, but some doors can be upgraded to provide greater fire resistance; a door closer will be part of this upgrade. Fire doors are basically hung in the usual way, but doors and hinges are fire rated and the doors are fitted with door closers and intumescent strips. Intumescent strips swell after exposure to heat and therefore create a tight seal. 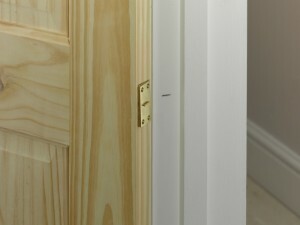 Seek professional advice on upgrading doors. 1. Mark the height of the closer on the hinge side of a door. Mark the depth of the closer cylinder on the drill bit with tape. 2. Drill a hole to the depth marked on the bit. Make sure the hole you bore is very precise, so that the closer will fit in smoothly when inserted. 3. 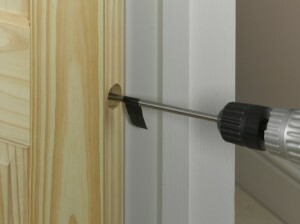 Insert the cylinder of the door closer into the hole until the plate is flush. Draw a pencil line around the edge of the plate as a guide. 4. Take the cylinder out and carefully chisel out thin slivers of wood inside the pencil line to remove the wood to the depth of the plate. 5. Reinsert the cylinder and slowly close the door so that the back edge of the anchor plate, with the small central ridge, marks the door lining. 6. Take out the cylinder, place over the mark and pencil around the plate. Chisel within the guideline to the anchor plate depth. 7. With pliers rotate the anchor plate, position the cylinder in the door edge, drill pilot holes and secure the inner plate in place on the door edge. 8. Carefully pull the anchor plate away and position the holding clip provided in place, to stop the chain being pulled back inside the cylinder. 9. With the chain slack, in its extended position, check again that the anchor plate sits snugly in place and pilot drill and secure it in position. 10. Finally, remove the holding clip with some pliers and test the door to see if it closes smoothly. The door closer strength can be adjusted. There is an incredible torque on the chain of the door closer, so be very careful when extending with the pliers and when you insert and remove the holding clip. Keep your fingers well out of the way! The door closer shown above is called a ‘concealed door closer’ for obvious reasons. There are other more visible options such as an overhead door closers, but these tend to be used more in commercial situations – they’re also fairly expensive. The other option is to use the Gibraltar door closer design, that is fitted on the architrave or wall to the hinging side of a door – these are well priced and easy to fit. You can find concealed door closers in many of the sheds – but to be honest the best range is found at Screwfix. Also take note here with the different levels of quality – I would always go for the Perko options, and yes they are a little more expensive but I’ve always found them to be the most reliable. This entry was posted on Friday, November 4th, 2011 at 11:14 am	and is filed under 'How-to' Guides, Doors and Door Security. You can follow any responses to this entry through the RSS 2.0 feed. You can leave a response, or trackback from your own site. A brilliant – well written (and photographed) article – thanks! Thanks for your kind words and glad I could help! Exactly right David – much easier when one end fixed. Excellent article, very well written. My only question relates to the very last sentence: “Door closer strength can be adjusted”. How on earth do you do this? I can’t see any sign of an adjustment mechanism on the ones I have. Sorry, should have made it clearer. To adjust, get to the position shown in step 9 photo. 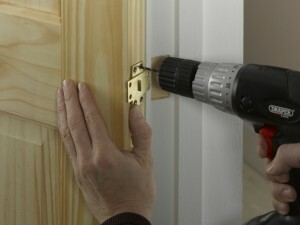 Unscrew the anchor plate from the door lining (be sure to have holding clip in position as shown). Then if you rotate the anchor plate (using pliers) it will either tighten or loosen the door closer strength, once fixed back in place. Bit of trial and error normally required here, to get the right strength.